Is General Motors Preparing To Add Motorcycles And Bicycles To Maven Car Sharing Service? 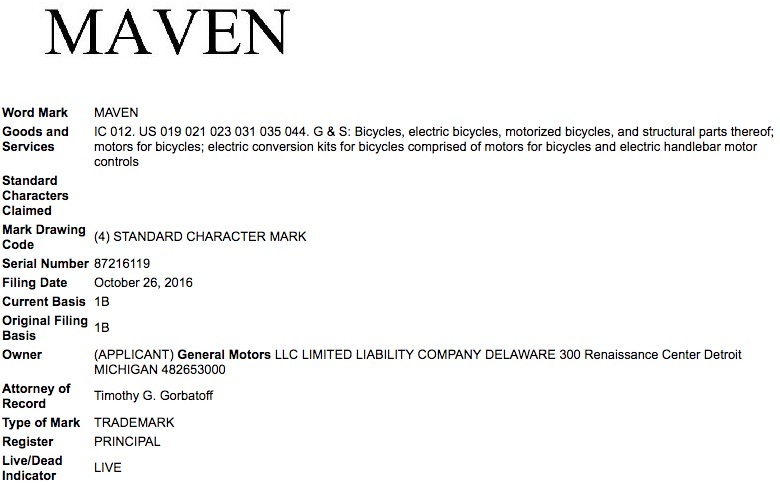 General Motors has filed an application to register Maven as a trademark with the United States Patent and Trademark Office (USPTO), GM Authority has discovered. Based on this filing, it would appear that GM is looking to expand its Maven car sharing service to bicycles and motorcycles. If that is indeed the case, then it would be quite the interesting development, as The General doesn’t produce either of those items. Stay tuned to GM Authority as we follow this story now and into the future, and follow our coverage of Maven news and GM news. Maybe GM should jump on the Elio band wagon and provide some support ! The Elio is Part Motorcycle ,part Auto, At 86 miles per gallon ,That would help EPA average for all of GM ! !